We started day two with a morning workout on the base. We went for a run to an outdoor fitness park and then did some interval training on the way back. We got back to the cottage and went straight for the beach: our first dip in the ocean. After stocking up on some provisions at the NEX, we stopped by the outdoor activities center and got some info on tours and trips we can take while we’re here. 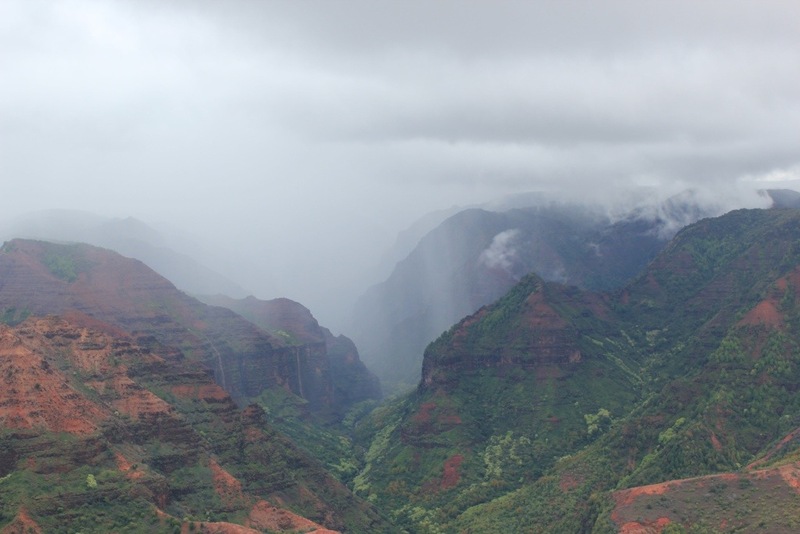 It started raining while we were up there, so we drove up to the Koke’e Museum and got some information abut hiking on the northwest part of Kaua’i. Some of it seems pretty serious, but we will likely take in some trails before we go home. When we got back to the cottage, we relaxed and eventually fell asleep together outside, looking at the waves crashing on the beach. We just finished up a dinner of grilled bacon cheeseburgers and baked beans, and are just about ready to call it a day. While we have been in paradise, our wedding photos have made their way around the interwebs. We saw links on Towleroad, The Advocate, Out.com, The Guardian, and The Huffington Post. They’re probably elsewhere by now, but we are busy with loving each other and not worrying about anything else for a week. This entry was posted in Honeymoon, Travels and tagged Hawaii, Kauai, Seattle, Waimea, Wedding. Bookmark the permalink. L O V E !!! It’s nice to see “in the eyes” of those experencing it…….Congratulations to you both, have fun, stay strong, stay safe, and L O V E one another. I salute you! John, USN, Ret.